This lamp replaces the 6W and 7W or any GX53-1 base lamps. 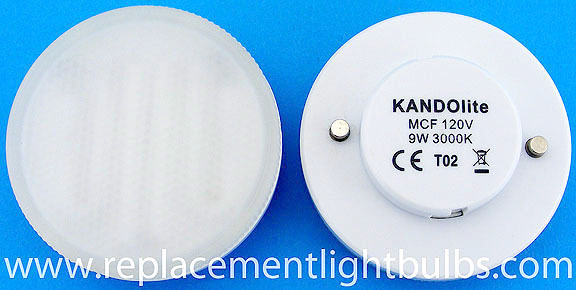 You can order the K566A socket for this lamp here. The GX53-1 base will fit into old GX53 lamp holder. This lamp is 3000K which is the color of the light. 3000K is often called Soft White or Warm White. This is interchangeable with other color temperatures like 2700K, 3500K, 4000K, 4100K, 4200K, 5000K, 5500K, 6400K and 6500K for example. All of these have the same electronics, the color is just different. All are considered white; the lower the number the more warm or yellow and the higher the number the more cold or blue. We also sell the 6500K lamp here. Typical Applications: Kitchen, Recess Area, Wardrobe, Stair, Ground Light, Wall Mount, Furniture and Cabinets.